At 9:30 AM each Sunday morning (except during summer break), children show up for their respective Sunday School classes. The lessons are based on the Bible and frequently follow the lessons read from the Bible in the worship service. We have classes for Pre-K through confirmation age, and all children are invited to attend the classes that fit their age group. Over the years, our Sunday School students have joined forces and had special projects to do for others. 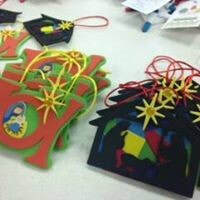 Christmas ornaments were made and distributed to our church members’ mailboxes. 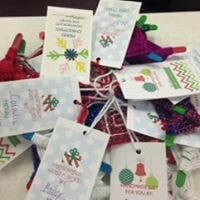 The home-bound members received their ornaments by mail, or in some cases they have been delivered to them by the students or adults in person. Mother’s Day and Father’s Day gifts have also been made for all the adult female and male members, and passed out by the children during our Sunday service.